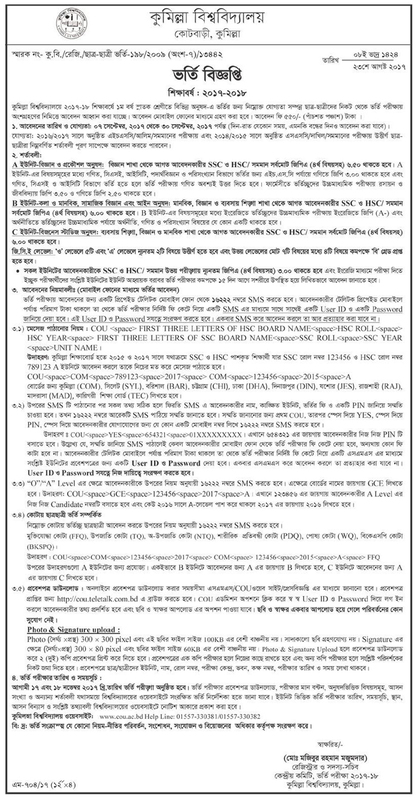 Comilla University Admission Notice 2017-18 at www cou ac bd. Here we will update CoU admission notice circular 2017-18. Online application process and Application fee SMS system. As well as Comilla University admission test result, Admit card download and seat plan download of all unit. Comilla University A unit, B unit, C unit, D unit admission result 2017-18. Every year authority of Comilla university publishes a circular for under graduation admission test for these subjects. This year Online Application Starting Date 7 September 2017Application Ending Date 30 September 2017.Admission test will have held 17 and 18 November. They take the test in 3 units. For application eligibility, applicants should pass SSC/Equivalent exam between the year 2014/2015 and HSC/Equivalent exam in 2016/2017. • Science Group: Students from Science group must have minimum total GPA 6.50 with 4th subject. • Business Studies Group: Students from Business Studies must have minimum total GPA 6.50 with 4th subject. • Humanities Group: Students from Humanities group must have minimum total GPA 6.00 with 4th subject. The application fee is 550 for each application. For more information you can visit their website www.cou.ac.bd. Thank you.